Over its useful product life, the iPhone 3GS experienced 2 major iOS updates, from the factory-released iOS 3 to the present iOS 5. I must say it is certainly the most value-for-money smartphone I have owned. I managed to update my phone within 12 hours of the release of iOS 5. Apart from difficulty in connecting to iCloud and iMessage, the update was smooth. Here’s a video that gives you a good summary of the list of features available on iOS 5. PC Free. You no longer need iTunes to get your iPhone started. iPhone will guide you through a few wizard steps to get your iPhone up and running without requiring you to plug your iPhone to a PC/Mac near you. As part of the PC-free experience, you will be able to update iOS firmware over the air without iTunes. You can also choose to sync your phone with iTunes over Wi-Fi. When enabled, your iPhone will automatically start syncing with your iTunes over Wi-Fi when your phone is plugged to charger and when your phone goes idle. Operate While Sync. 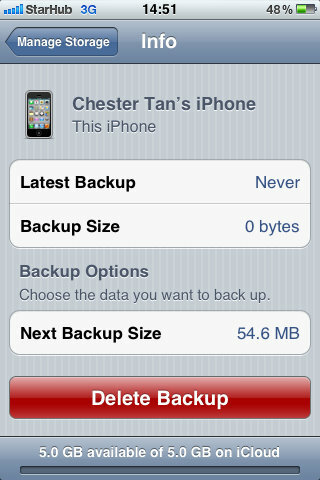 During iTunes Sync with USB, you can still operate the phone. You can still use iTunes to do what you are used to all these years. And you can get used to the ability to continue to operate the phone even during Sync operation. 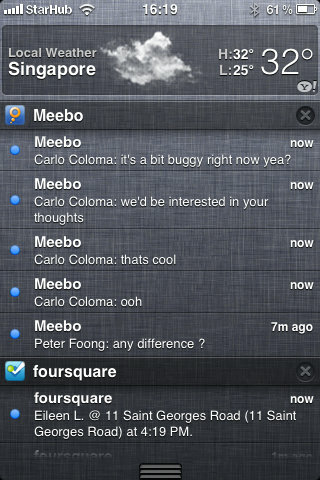 Notification Center. The most important and possibly life-changing feature of iPhone, you can drag down the status bar to reveal the Notification Center where all your unread notifications appear. You no longer need to scan through all your apps to look for the red bubble and find out what you have missed. Camera button. The Up Volume button can now be used as a shutter button. Edit Photos. You can edit photos inside the Photos app. Create Album Folders. 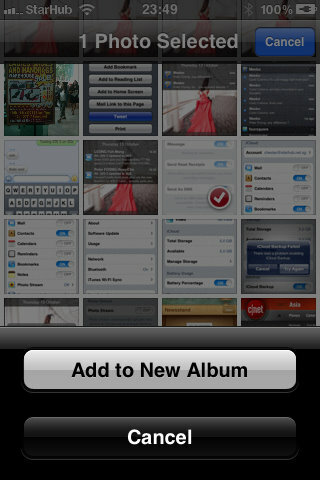 You can create album folders and add photos from other albums to them. Twitter Integration. 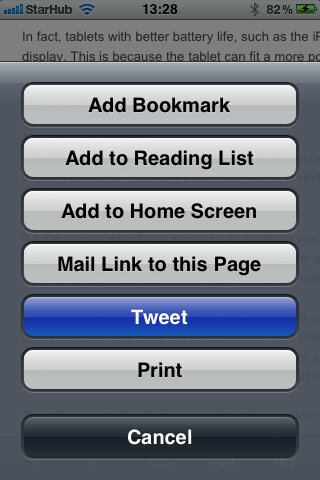 You can seamlessly share your content on Twitter without third-party apps. Reading List. You can save any web page as text-only format and read it later. Apps Usage Summary. 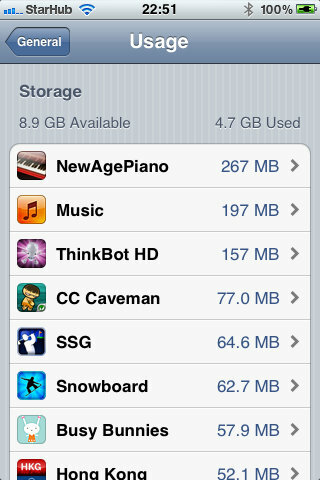 You can see which apps use the most storage in your iPhone, and uninstall or clean-up the data. Email formatting. You can format your email text – bold, italics, underline, etc. Calendar view. You get a better experience using the calendar. iCloud. 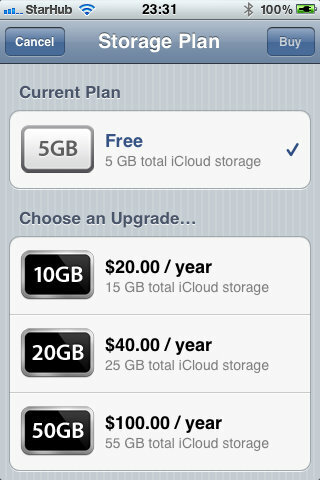 Another major feature for iOS 5, iCloud offers every registered user a 5GB online storage which can be used to backup your iPhone data, to host your new iCloud PIM – email, contacts, calendar and tasks. Very much similar to Google’s suite of PIM apps. iMessage. It’s a hybrid of WhatsApp and IM, which allows you to send multimedia messages over data network. 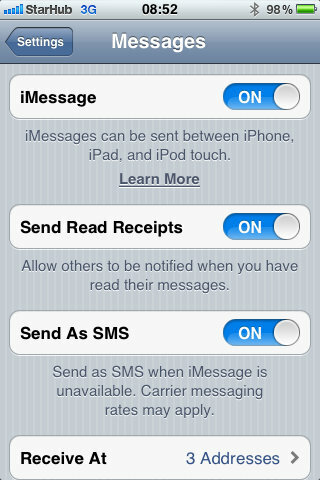 iMessage detects your recipient and turns from the usual green bubble to blue bubble if he is also on iMessage. If you sent message to the recipient’s mobile number, only his iPhone will receive the message (like WhatsApp). If you sent message to the recipient’s email address, then all his iOS devices that are registered with the email address will receive the message (like IM). Camera shortcut button. You can’t start the camera from the lock screen. Reminder by Location. There is no option for you to set to remind based on location. Vibrate alert. You can’t create your own custom vibrate pattern alert. Battery drains faster than previous OS, due to more Cloud activity. The phone runs with noticeable lag when opening some apps. The phone is generally less stable, but with app updates, this problem could go away over time. If your current 3GS feels rather slow and unstable with the kind of usage load you are experiencing, perhaps you should consider upgrading to a new iPhone. If your phone is working fine and are wondering whether you should update the phone, then please read this blog again from the top. If you follow the iTunes instructions, you should be able to restore all your apps and settings in the new OS. Still, be prepared for any mishaps and backup all your valuable data before embarking this major software update.